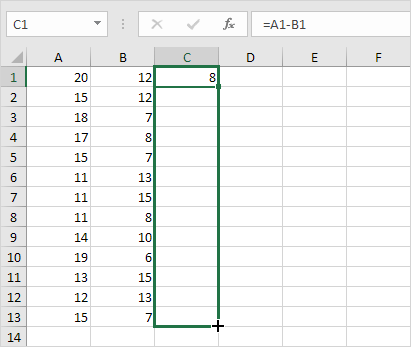 A clever Excel trick to change negative numbers to zero but leave positive numbers unchanged. Below you can find two columns with numbers. 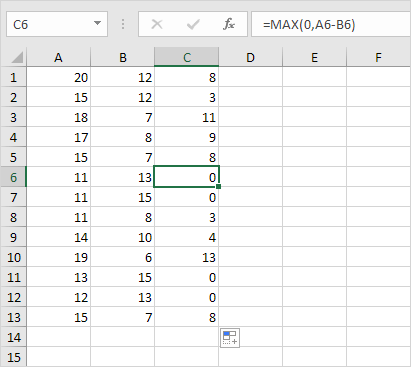 To subtract the numbers in column B from the numbers in column A, execute the following steps. 3. Click the lower right corner of cell C1 and drag the formula down. 4. 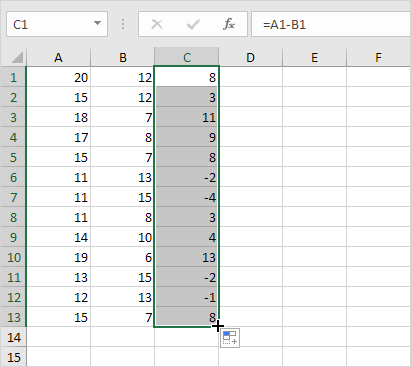 To change the negative numbers to zero but leave the positive numbers unchanged, instead of =A1-B1, use =MAX(0,A1-B1) and drag the function down. Explanation: the MAX function returns the maximum of two values. If the result of the formula is negative, the function returns 0.